GM John Lynch said McKinnon (knee) will stay with the 49ers through April 1, when his 2019 base salary ($3.7 million) becomes guaranteed, Matt Maiocco of NBC Sports Bay Area reports. The 49ers signed Tevin Coleman to join McKinnon (knee) and Matt Breida (ankle) at running back, Jennifer Lee Chan of NBC Sports Bay Area reports. Coach Kyle Shanahan said Wednesday that he expects McKinnon (knee) to handle the lead role in the 49ers' backfield in 2019, Kevin Patra of NFL.com reports. San Francisco general manager John Lynch said McKinnon (knee) is six weeks ahead of schedule in his recovery process, Matt Maiocco of NBC Sports Bay Area reports. McKinnon (knee) caught passes from Jimmy Garoppolo (knee) recently, SiriusXM NFL Radio reports. McKinnon doesn't need crutches to move about as he recovers from a torn ACL in his right knee, Nick Wagoner of ESPN.com reports. Analysis: McKinnon suffered the injury between the preseason slate and preparation for Week 1, leaving the 49ers without one of their big offseason acquisitions for the entire campaign. Following surgery on Sept. 11, Matt Maiocco of NBC Sports Bay Area reported McKinnon's ACL tear was "pretty clean," a positive sign for his rehab. In McKinnon's absence, the trio of Matt Breida (ankle), Raheem Mostert and Alfred Morris have combined to fuel the NFL's second-ranked rushing attack (137.4 yards per game). McKinnon had surgery Tuesday to repair an ACL tear that's believed to be "pretty clean," Matt Maiocco of NBC Sports Bay Area reports. Analysis: The report doesn't provide any specifics but might be taken as a hint that McKinnon avoided major damage to the other ligaments in his knee. If so, the timing of the injury should allow him to return for Week 1 of next season, though he still has a grueling rehab process ahead. Meanwhile, Alfred Morris and Matt Breida are forming a timeshare in the San Francisco backfield. The 49ers placed McKinnon (knee) on injured reserve Monday, Ian Rapoport of NFLNetwork reports. Analysis: After tearing the ACL in his right knee Saturday, McKinnon was bound to land on IR. He'll now commence with rehab, allowing Alfred Morris and Matt Breida to churn out yards on the ground for the 49ers this season. McKinnon sustained a torn ACL in his right knee at Saturday's team workout, Ian Rapoport of NFL Network reports. Analysis: During said workout, McKinnon went to the ground while making a cut, suffering a knee injury in the process. With his first season in San Francisco over, the 49ers will trust in Alfred Morris and Matt Breida to power the ground game. McKinnon (calf) suffered a non-contact knee injury during Saturday's practice, eliciting concern from coach Kyle Shanahan, Nick Wagoner of ESPN.com reports. "Something with a knee, we'll find out later," Shanahan said. "We're nervous about it, that's for sure." Analysis: Shanahan's comment doesn't inspire any confidence, nor does the fact that McKinnon is already scheduled for an MRI. The obvious concern is an ACL injury, but we can't make any assumptions until McKinnon has actually been evaluated. He was working his way back from a minor calf injury, with the expectation of being ready for Week 1 in Minnesota. The Niners likely will turn to Matt Breida (shoulder) and Alfred Morris to lead their backfield if McKInnon isn't available. McKinnon (calf) was injured during a team workout Saturday, Matt Barrows of The Athletic Bay Area reports. Analysis: Per Barrows' source, McKinnon's injury "did not look good." Signed in the offseason to serve as the 49ers' No. 1 back, McKinnon missed most of the preseason due to a calf injury, but had been increasing his conditioning work in recent days. The nature of the current concern will be known in due time, but Alfred Morris and Matt Breida (shoulder) could be the team's go-to running backs to begin the season. McKinnon (calf) and Matt Breida (shoulder) both went through conditioning drills in full uniform at Tuesday's practice, Cam Inman of The San Jose Mercury News reports. McKinnon (calf) is doing individual conditioning work at Tuesday's practice, Cam Inman of The San Jose Mercury News reports. Analysis: Already ruled out for the rest of the preseason, McKinnon apparently is making progress in his recovery from a calf strain he suffered during practice Aug. 12. The 49ers are playing it safe with all of their injured players, perhaps aiming for returns to full practice participation once it's time to install the gameplan for Week 1 in Minnesota. McKinnon seems to be on track to face his former team in the opener. McKinnon (calf) will be held out for the rest of the preseason, Brian Murphy of KNBR 680 reports. McKinnon is dealing with a right calf strain, Nick Wagoner of ESPN.com reports. Analysis: McKinnon was removed from Sunday's practice with what was thought to be a knee injury, and he then spent the rest of the day watching from the sidelines. However, a recent MRI apparently showed the running back sustained no structural or nerve damage, so a long-term absence seems unlikely. 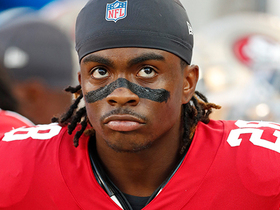 The 49ers will reportedly give McKinnon a week of rest and then re-evaluate his situation next week. McKinnon has been diagnosed with "a muscle strain," Adam Schefter of ESPN reports. Analysis: The results of the MRI are in, and McKinnon has dodged a bullet with his potential knee injury. With no structural damage evident, he may be absent from practice in the short term but won't be joining backfield mate Matt Breida (shoulder) in the recovery room for a lengthy spell. Only time will tell whether McKinnon will be ready for Saturday's preseason game in Houston. McKinnon will undergo an MRI on his right knee, Nick Wagoner of ESPN.com reports. McKinnon was removed from Sunday's practice due to a possible knee injury, Eric Branch of the San Francisco Chronicle reports. Analysis: McKinnon watched the remaining drills and wasn't being looked at by the 49ers' medical team, but the issue will be one to watch with one running back (Matt Breida) already out of commission for awhile due to a shoulder separation. McKinnon caught a pair of touchdowns from quarterback Jimmy Garoppolo in Tuesday's 7-on-7 red-zone scrimmage, Joe Fann of the 49ers' official site reports. McKinnon said he is excited to work under 49ers coach Kyle Shanahan, who believes the running back is much better than his statistics suggest, Matt Barrows of The Sacramento Bee reports. "I know the stuff we liked McKinnon on," said Shanahan. "If I could just cut up those numbers I think they would have been good numbers. But when you take the whole accumulation of things, I think they watered things down." McKinnon has agreed to a four-year, $30 million contract with San Francisco, Adam Schefter of ESPN reports. Analysis: McKinnon was set to be a second or third option if he returned to the Vikings with Dalvin Cook coming back from a knee injury, but now he'll at least have a shot to compete for the primary job in the 49ers backfield. The size of the contract suggests McKinnon will enter camp as the favorite for lead-back status, ahead of Matt Breida, Joe Williams, Jeremy McNichols and Raheem Mostert (knee). Of course, there's still time for the Niners to supplement their RB stable in free agency or the draft. McKinnon, who is set to be an unrestricted free agent at the end of the league year, intends to sign with a team that will give him a bigger offensive role than he had with the Vikings, ESPN's Courtney Cronin reports. "I want to be the guy," McKinnon said. "I don't put in all the work in the offseason to come back and be in this role. I appreciate the role. It worked out well, but I want bigger and better things for myself." McKinnon carried 10 times for 40 yards and caught 11 of 12 targets for an additional 86 yards during Sunday's 38-7 loss to the Eagles. Analysis: McKinnon managed a respectable four yards per carry against the toughest run defense in the NFL, but he did most of his damage catching short passes as his team played from behind for virtually the entire game. McKinnon enjoyed an increase in his usage as a pass catcher this year, finishing with career highs in targets, catches and receiving yards. He also posted personal bests in rushing yards and total touchdowns, which could support his value on the free-agent market this offseason. McKinnon had 12 carries for 44 yards in Sunday's win over Chicago. Analysis: McKinnon has been explosive this season but taken a back seat to Lativus Murray in the second half of the season. McKinnon has 283 yards rushing and 218 yards receiving with one touchdown in his last eight games. McKinnon can still produce big plays and will likely be a bigger factor in the passing game if the Vikings need to go to the air in their first playoff game after a bye. McKinnon carried seven times for 42 yards and caught one of two targets for an additional nine yards during Saturday's 16-0 win over the Packers. McKinnon rushed nine times for 24 yards and added seven catches for 114 yards on eight targets in Sunday's 34-7 win over the Bengals. Analysis: While McKinnon was outplayed by Latavius Murray on the ground, he led his team in catches and receiving yards. Both members of this running back duo have provided strong fantasy value since Dalvin Cook tore his ACL in Week 4, but it's a bit worrying that McKinnon hasn't topped 50 rushing yards in his past eight games. McKinnon (shoulder) practiced in full Thursday. 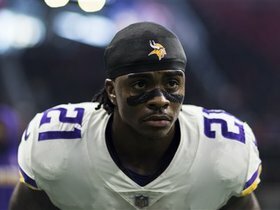 Analysis: Since Dalvin Cook suffered a torn ACL in Week 4, McKinnon has averaged 76.9 yards per game from scrimmage and scored five total touchdowns across nine outings. That said, McKinnon hasn't surpassed 60 scrimmage yards in five consecutive contests. After a brief reduction in reps Wednesday, he returned Thursday without limitations, setting himself up to take advantage of the Bengals' 19th-ranked defense Sunday. McKinnon was a limited participant at Wednesday's practice due to a shoulder injury, Courtney Cronin of ESPN.com reports. McKinnon rushed seven times for 46 yards and caught two of three targets for nine more in Sunday's 31-24 loss to Carolina. Analysis: McKinnon was far more effective on a per-touch basis than Latavius Murray, averaging 6.6 yards per rush compared to Murray's 1.6. Neither running back was able to get into a rhythm with Minnesota never holding a lead in this one, but the team's 10-3 record suggests gameflow won't be an issue most weeks. If McKinnon keeps outplaying Murray, he'll get a greater share of the workload moving forward after being out-touched, 11-9, in this one. McKinnon carried nine times for 24 yards and caught all five targets for 28 yards and a touchdown during Sunday's 14-9 win over the Falcons. Analysis: McKinnon averaged an underwhelming 3.7 yards per touch in this one, but he salvaged his day from a fantasy perspective with a two-yard touchdown reception. Latavius Murray received a larger workload yet again and was much more effective on a per-touch basis, though he wasn't able to find the end zone. McKinnon will maintain a notable role next week against the Panthers, but he will need to make better use of the touches he gets with Murray continuing to head the backfield. McKinnon rushed 13 times for just 23 yards and caught a 31-yard reception during Thursday's 30-23 win over Detroit. McKinnon rushed 14 times for 48 yards and brought in five of seven targets for 12 yards in Sunday's 24-7 win over the Rams. McKinnon rushed 10 times for 32 yard and and added two catches for 15 yards in Sunday's 38-30 win over Washington. 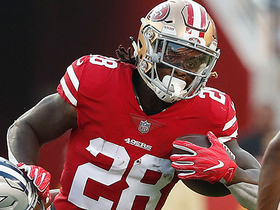 NFL Network's Ian Rapoport reports the latest on the knee injury to San Francisco 49ers running back Jerick McKinnon. 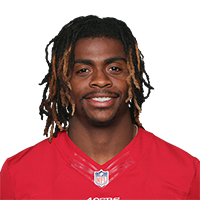 NFL Network's Ian Rapoport confirms that San Francisco 49ers running back Jerick McKinnon's 2018 season has ended. 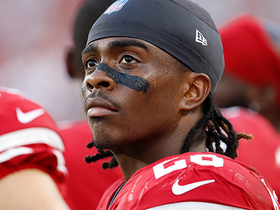 NFL Network's Steve Wyche and Terrell Davis discuss how the San Francisco 49ers will adjust without running back Jerick McKinnon. 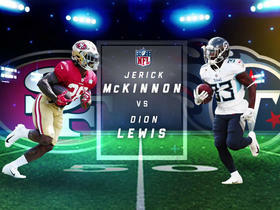 NFL Network Senior Fantasy Analyst Michael Fabiano and Kay Adams debate who is the better fantasy option between 49ers running back Jerick McKinnon and Titans running back Dion Lewis. 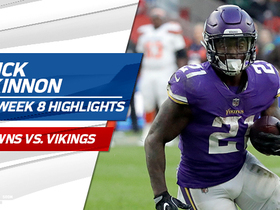 Check out Minnesota Vikings running back Jerick McKinnon's highlights from Week 8 against the Cleveland Browns in London. 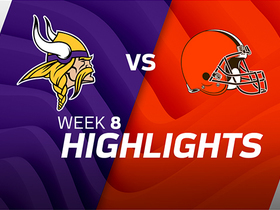 Watch the highlights from the Minnesota Vikings 33-16 victory over the Cleveland Browns in London during Week 8 of the 2017 NFL season. 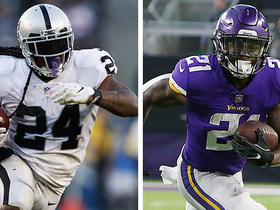 NFL Network's Michael Robinson and Reggie Wayne discuss which running back will have more rushing yards in 2018, San Francisco 49ers RB Jerick McKinnon or Oakland Raiders RB Marshawn Lynch. 49ers general manager John Lynch explains why the team chose to sign running back Jerick McKinnon in the offseason. 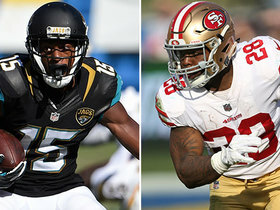 NFL Network's David Carr and Shaun O'Hara list the free agents they believe landed in perfect spots to succeed in 2018 and beyond. 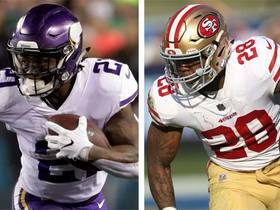 NFL Network's Maurice Jones-Drew and Deion Sanders debate which running back, Jerick McKinnon or Carlos Hyde, will have a better 2018 season.